Now here is an interesting situation involving two much maligned magic industry figures. According to Norm Clarke, Val Valentino and his friend Ron Jones were escorted to the entrance of the Luxor when they were spotted by Criss Angel at a party being hosted by the Mindfreak star. Barely mentioned in the Clarke column is that Valentino is better known (or unknown) as the Masked Magician, a controversial figure in our industry to be sure. 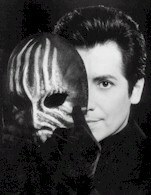 Completely unmentioned is that Valentino more recently presided over an entire episode of the newest incarnation of his franchise (2008’s Magic’s Biggest Secrets Finally Revealed) where Angel’s biggest illusions were spoiled, albeit for a middling audience and with negligible cultural resonance compared to his popular, if boring, specials from over a decade ago. So there we have it, Criss vs. Val. Who ya got?